Be the coolest driver on your block and destroy boredom with a Genuine Toyota Rear-Seat Entertainment System, available from Tuscaloosa Toyota in Alabama ‐ serving Birmingham, Columbus, and Jasper. 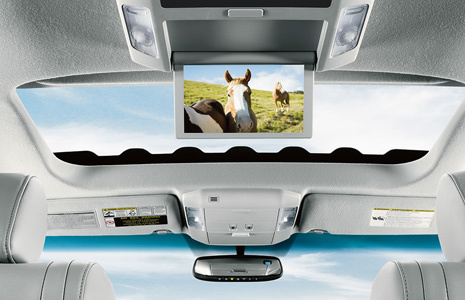 The Toyota Rear-Seat Entertainment System is available to a number of Toyota models, but ensures entertainment for 100% of passengers when in use. Each system includes two 7-inch LCD display monitors with integrated DVD players, RCA A/V jacks that connect to external outputs, and two sets of wireless headphones. When the displays are active, they can work independently or simultaneously and can play DVDs, CDs, CD-Rs, CR-REs, and MP3 formats while connecting with either the included wireless headphones or the vehicle's audio system for surround-sound quality. Displays are mounted on easily removed docking stations that provide security when in use.